Every Business owner has the eventual goal of having customers promote his or her brand genuinely without incentive. Individuals embodying the ideal of genuine incentive free promotion are referred to as brand ambassadors. To have this kind of market penetration and wholesome grass-roots style brand promotion can take years. With a new social media marketing platform called Up Show TV, brand ambassadors can be created over night. Spoleto Italian is the first mainstream fast-casual brand to introduce this new program into the United States market. The social marketing display encourages users to post a custom hash tag and use a photo or video from the given brand to post to his or her personal Instagram or Twitter. In doing this, their post goes up on the in-store display within seconds giving instant gratification. This genuine message from the user directly promotes the brand without appearing like spam or an ad creating new brand ambassadors daily. The advanced backend system allows Spoleto Italian’s marketing team to easily engage the loyal customer and thanks or reward them for promoting the brand. This new technology allows the business to maintain an exclusive customer relationship through social media. 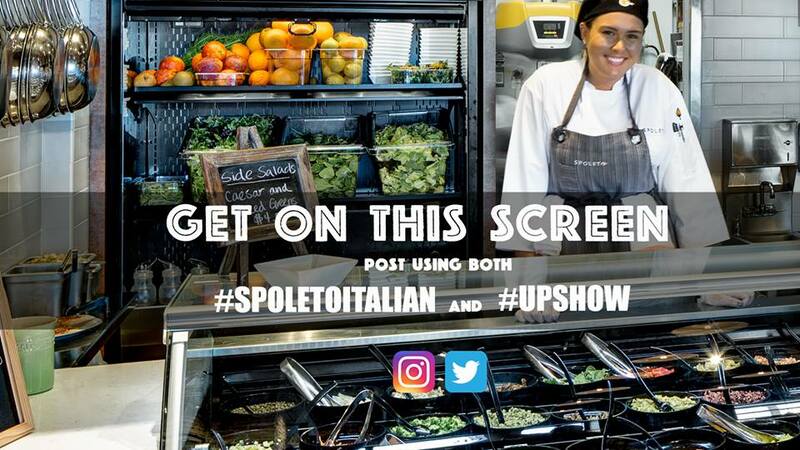 Spoleto’s focus is to empower culinary freedom by having customer’s custom creations arrive on the big screen and to include this new platform in all new locations.